What is a hurricane for you? A suddenly annoying situation if you have to cancel a cruise in the Caribbean? A moment of anguish if you know a relative who lives in the south? OR is it a fearsome announcement that means prepare yourself because the eye of the storm is heading straight toward your town? I live in Fort Lauderdale, FL, and I survived hurricanes Frances in 2004, Katrina and Wilma in 2005, and several tropical storms. Now the TV announces that the hurricane season is starting. Difficult to believe when the sun shines gloriously and the ocean is as even as a lake. How do you prepare and behave when the forecast predicts a hurricane? Panic and evacuate as we did during our first summer in Fort Lauderdale or stay and weather the storm hoping it would bypass us? In Florida, we survived Frances and Katrina, then relaxed and forgot. So when the TV asks everyone to prepare for Wilma, we did it with a calm know-it-all smile on our lips. There was no way on earth we were going to panic and leave our apartment. Little did we know that two days later we would be sitting in the living room of our apartment, listening to the wind blow at hundred-fifty miles/h. The sound was horrific. I've never seen or heard wolves in my life but to my feverish mind the wind sounded like the howling of a pack of wolves. We lost electricity and telephone. The elevators stopped. The hurricane shutters tightly closed left us in the dark except for a candle lit in the bathroom and another in the kitchen. In the middle of the day, more precisely at 11:20 am I felt the building shake. We lived on the eighteenth floor and the ground moved under us. I grabbed my husband’s hand and said, “Do you think the building can collapse?” He said he was more worried about the glass door to the balcony shattering. Together we stuck towels against the panels to stop the shaking of the glass and the seeping of the water. After ten hours, the noise subsided and the storm abated. We climbed down the eighteen floors and reconnected with our neighbors. We were among the lucky ones who hadn’t suffered broken windows or major damage. One of our neighbors reported that the wall between her bedroom and the neighbor’s living room had collapsed. The next day the neighborhood was unrecognizable with devastation everywhere, cars smashed on top of each other, broken electric lines lying across the street, uprooted trees, windows, chairs and tables messing the beach sand. But the hurricane brought people together, those without damages helping those severely affected. We gathered on the terrace of the building, barbecued and ate together for five days while waiting for the electricity to be restored. Many buildings remained without water for ten days and our friends came to shower in our place. Some residents had to leave the apartments for two to three years to allow repairs to be done at turtle pace and insurance to cover the cost. Eleven years have gone since Wilma but whenever I hear the word hurricane, I always remember Hurricane Wilma and I wonder what is in our forecast for the next four months. So what does a hurricane mean to you? 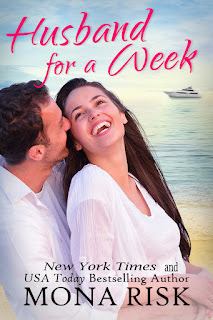 Husband for a Week is a novella that made the New York Times and USA Today bestseller lists as part of Summer Fire Box. Jonathan Ramirez values his law practice and doesn’t believe in commitment, especially not to Isabella Cantari, a sassy young woman, who seems to attract trouble wherever she goes. Sicilian vendetta, fake husband, and an irascible matchmaking grandmother complicate Jonathan and Isabella’s lives. Can love conquer all? Mona, I lived in northern FL for 12 years in an area not prone to hurricanes. We had some tropical storms from time to time, but never a full-fledged hurricane. We lived on an island so if a hurricane came there was an automatic evacuation. If you decided not to go, you were out of luck if you needed to be rescued. After Wilma, we drove down to get my husband's aunt who lived near West Palm because she had no power and wasn't expected to have any for weeks. I remember the twisted signs and devastation everywhere. She was glad to get out of there. Now that I live in AZ and no longer have property there (as of last month), hurricanes are something on the news, but I do understand the destruction they can cause. Apart from the hurricanes, Florida has so much to offer. I call it my paradise on earth, but I sincerely hope not to meet with another hurricane. I grew up in Biloxi which has been hit with two category 5 hurricanes--Camille and Katrina--not to mention all the others between those. Very scary. The first year we moved to Florida, 2004, there were two hurricanes that came through the area where we were living at the time. Luckily we didn't have any problems because we lived in a low area and the hurricane didn't dip down until way past us but areas around us got damaged heavily. That was our welcome to Florida. Now we are living an hour from Tampa and I'm afraid we will soon have to worry about hurricanes. In 2004 it was Frances!I remember we evacuate for this one and drove to VA.
What a welcome for you! Living near Charlotte in SC since 1997, we haven't experienced a hurricane, although we've heard tales about hurricane Hugo.